Logitech isn’t synonymous with futuristic technology these days. But in the early 1980s, it was working at the very edge of human-computer interaction, imagining the hardware that would allow human hands to interact with a computer’s screen. Its founders, Daniel Borel and Pierluigi Zappacosta, met in the 1970s at Stanford, where both were computer science grad students. They named the company after their specialty at the time, software; Logitech comes from the French word for it, “logiciel,” as the company explains. Like so many other software makers, the duo wanted to develop software that would let users interact with a computer visually. But to do that, they would need an input method beyond a keyboard. They would need a mouse. Largely thanks to companies like Logitech, the mouse soon became the primary way for consumers to interact with PCs. Logitech’s business boomed, selling hundreds of thousands of mice and even collaborating with Apple, then a fledgling PC company. In the late 1980s, Logitech went looking for a logo. They went straight to Silicon Valley’s frog design, then a young industrial design startup whose founder had developed Apple’s wildly popular Snow White design language. Timothy Wilkinson was working at frog—that’s how he met Logitech’s founders. When he designed their logo, he didn’t even have a PC. “I didn’t even know what a cursor looked like,” he told me, saying that the red cursor in the corner was originally a plus sign. Instead, he listened to the founders talk about their business. “Their description of a future in which Logitech would play a vital role in we human being’s increasingly common, everyday interactions with our evermore familiar computers, was intoxicating.” he said. That intoxicating vision of the future, where computers were woven into the fabric of every day life, and where hardware was the extension of the human body, was what Wilkinson wanted to express in the company’s logo. He drew it by hand, on a drawing board, describing it as part sculpture, part face, with hand-cut type that was inspired by the seminal design magazine of the 1980s, Emigré. “I was attempting to represent both human physique and spirituality; our mental and physical potential when slipped beneath the cyber mantle,” he explains. In a way, the design was like a hieroglyph of the first graphical users interfaces, its eyes and icons representing an essential relationship between human and computer. That’s a romantic and futuristic sentiment, but it illustrates the optimism and surreal technological vertigo of Silicon Valley in the 1980s. Frog in 1988 was a vanguard of design—it dictated the way the first computers arriving in the hands of consumers felt, looked, and even sounded. Wilkinson’s logo described that optimism and idealism perfectly: A human eye surveying the world around it, one lash made up of a computer cursor that looks upward, as if towards the future. 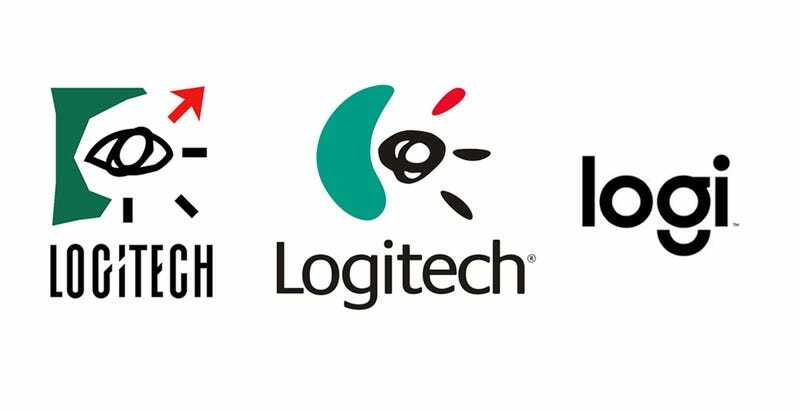 Logitech is among the few tech companies that have not only endured multiple cycles of computing, and stuck with the primary logo it began with. So much so that Wilkinson’s logo may have felt dated, almost too familiar—like finding an old AOL CD at your parents’ house, a decade after the free hours expired. So it’s easy to understand why the company was eager to do away with its symbol and join its peers with an overhauled logo last month. Wilkinson is certainly gracious about the transition, though he wonders if getting rid of one of the most recognizable logos in tech history is the branding equivalent of throwing the baby out with the bathwater. “It diminishes the Logitech identity by watering-down what had possessed a totemic, iconic symbolism,” he says. Why did Logitech drop the “tech” in its name? Funnily enough, the company explains it the same way it explained how consumers would interact with computers in the 1980s. “Tech is everywhere,” the company’s VP of brand development told Gizmodo’s Darren Orf. “Tech is in the air you breathe...it’s in your clothes...in the future, ‘tech’ doesn’t say anything.” That’s remarkably similar language to how Wilkinson remembers the company’s mission in the early 1980s: Technology is just an extension of the human body. The new logo shares a lot in common with UI and design trends today: All lowercase letters, a play on negative space, gem-toned and ultra-flat, it’s got a sibling in Google’s Material Design language. In some ways, it’s a non-logo, it’s designed to fade away—a bit like Logitech’s flagship product, the mouse, is fading away. As computer makers go deeper into touch-screen devices, and begin to experiment with gestural and voice recognition interaction models, the mouse is beginning to look like a specialized peripheral, rather than a universal one. Logitech’s business will shift accordingly. Wilkinson’s logo had personality, and a symbolic nod to the business it represented. The new one is fine—slick, unremarkable, and visually clever, like many logos in the consumer tech business these days. Logitech wanted to be more like its peers, and its brand has transformed along with the product it offers. Still, it’s hard not to look at the old logo and feel a twinge of nostalgia for an era of tech—and logos—that was big, weird, and really, really exciting.